With the 3850 brings a plethora of change. The evolution of IOS to IOS-XE, WLC features terminated in hardware, and advanced routing protocols on board set the scene for a massive access and distribution overhaul. Some big physical changes though come with the introduction of Stackwise 480. The 3750-X utilized the older, now superseded Stackwise-Plus technology. This focused on a hybrid control-plane process, N:1 stateless control-plane redundancy, Distributed L2/L3 forwarding, and stateless L3 protocol redundancy. The newer Stackwise 480 supports a centralized control-plane process, 1+1 state full redundancy achieved by SSO, Distributed L2/L3 forwarding redundancy, and utilizes the IOS HA framework. The new Stackwise 480 cables are vastly different to the old clunk silver battleships. The streamed lined cable pictured above replaces the old style. Its makeup utilizes the concept of rings. There are three east bound and three west bound rings. Each ring consists of 40 gigabit bandwidth. Amounts to 240 gigabit through the stack. With reuse this number climbs to 480 gigabit. 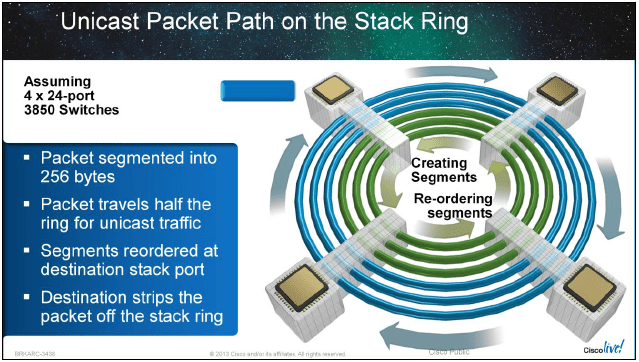 Packets traversing the stack-ring are segmented and reassembled in hardware. This is done at 256 byte segments. A fault in the stack is detected initially in hardware. This detection is passed into the software. Once the software is notified the Ring Wrap process is initiated. This process is sub millisecond. The process to heal is similar. The switches on either side of the failure use their hardware first to detect the other side. The software validates the link and the connection is reestablished gracefully. This process is known as the Ring unwrap. It is important to note that the unwrap is slower than the wrap. Unicast packets on a Stackwise 480 support destination stripping. This means that when a packet reaches its destination is removed from the ring. This leaves the rest of the rings bandwidth free to be used. Multicast packets rely on source stripping. 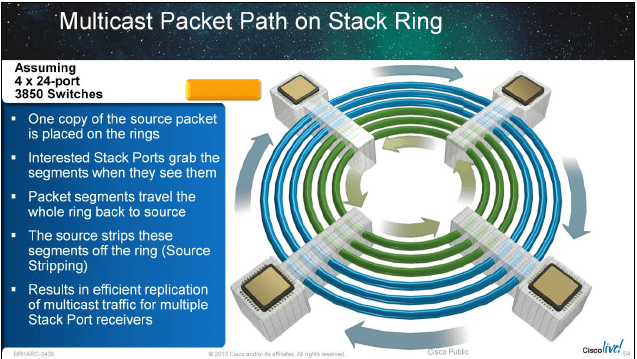 Source stripping requires a packet that traverse the ring upon arrival to the destination, copy the packet and send it the rest of the way to the source and then is removed from the ring. This is wasteful and bandwidth intensive. Unicast packets on a stack work on a token based access scheme with six different tokens associated to the six rings. Depending on the tokens which each specific ASIC has access to they might use two or three, or consume all six. Due to the nature of 3 east and 3 west links the ability to pass traffic around half the ring is extremely effective. I like to remember the behavior of Unicast packets on a stack as half-ring! Multicast packets on a Stackwise 480 works with source stripping. When a multicast packet comes in they are sent out to particular ASICs. It is sent out around the ring and interested parties pick up the packet. It is continued around the stack and back to the source where it is stripped and discarded. This method allows stack members and their ASICs that might need the multicast packet to be able to get it. Any node that does get the multicast packet replicates it for the outbound and local ports. This saves on congestion arising from sending individual copies. The 3850 Stackwise 480 expands upon the new inbuilt ASICs to help achieve up to 200 forwarding, non blocking ports. Stackwise 480 allows the entire unit to stack up to 480 Gigabits of forwarding capacity. There is a limit of 4 switches per stack and this is something to consider during a design. The notion of an Master, hot-standby, and standby units allows the switch to be highly resilient due to the ability to now leverage SSO technologies. The ASIC aforementioned which is the beating heart of the 3850 is known as the UADP ASIC. It supports programmability and intelligence with foundation support for Cisco Open Network Environment, Software Defined Unicorn support, and OnePK movements. This is expected to be expanded via software updates. I am impressed thus far with the improvements on Stackwise. In the 3750E/G days I found the technology partially reliable and stack modifications in flight were sphincter twitching at best. The future looks bright for the stack! Interesting. Seems almost like some of the optical ring tech from my days in telecom. Good stuff, looking forward to getting some hands on time with it. Thanks for commenting. This is a HUGE improvement upon the 3750 platform. I have a myriad of issues where I am. I almost wonder why I stack. I do have a stack in the lab that is purely there for power stack. SW480 with its SSO capabilities is where I am excited to see development. I’ll report back when I get some hands on. Did you ever get your hands on it…Josh?? About time, Cisco! 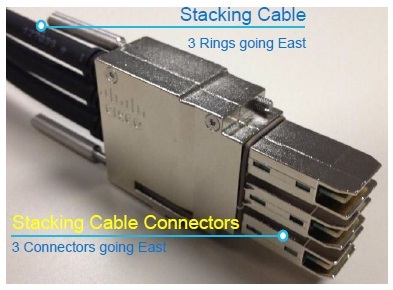 I cannot tell you how many headaches we had with those StackWise cables on the 3750’s. Looks like a great improvement! Seems like an improvement, but only limited to 4 members per stack – that is not ideal!!!!!!! That limitation was removed in version Version 03.02. I believe the limit is now 9. I currently run a good number of 5 stacks and prefer to not go above 6.
i confirm; i am running a 3850 stack of 8 members. Works pretty well. I am new to this and have a question regarding upgrading the OS and rebooting. We have two switches setup in a stack. I recently had to reboot them and issued the reload command. This caused both switches to reboot at the same time. This caused a number of problems. We need to do a OS upgrade soon and I know we have to reboot the switches for the upgrade to take effect. It was our understanding that with SSO/NSF that we could do this without downtime (we will do it during a planned outage to be safe). I talked CISCO and was told this is not possible that both switches would boot at the same time. This does not seem to match what I am reading about stackwise-480. I am fairly new to CISCO. We just moved from all HP to mostly all CISCO. I have a question regarding stacking. I have been in contact with TAC asking about upgrading the software on these switches. We have two connected in a stack. When doing the upgrade do you have to reboot the two switches at the same time or is it possible to reboot one at a time. These two switches are connected to our FI and if they both reboot it causes issues with the servers. We were led to believe that we could do the upgrade on the fly when we bought the switches but TAC is telling us no.